A total of 592 signatures coming from 24 countries, mainly from Portugal, Italy, Germany, Moroco, Belgium, Romania and Switcherland. All of them have presented th latest technology and the most advanced services in terms of building and industrial support in the already closed Subcontracting 2015 during the past 26-29 of May. 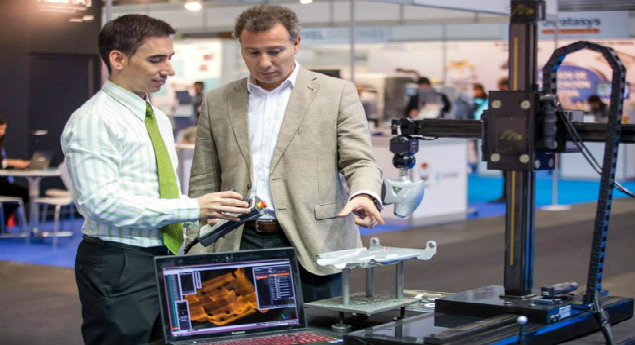 During the last 4 days Innovalia Metrology’s stand along with ACICAE-Cluster from the Car sector of the basque country, received a nnotorious and constant affluence of visitants. BEC’s 5th pavilion in Barakaldo was shared by those companies focused in building processes such as metallurgy, mechanization, surface treatment procedures, tinkering and machinery. The metrological unit of Innovalia presented M3 portable, a high precision standalone 3D scanning system, equipped with M3 platform (Multisensor Massive Measurement), perfect to optimize the measurement processes in a natural and efficient way, and with the optical sensor Optiscan, whose unique design allows the integration into any system for both laboratory and in-line manufacturing. The main novelty of this year is that both systems included veneer and plastic applications.